Are you concerned that you may not be fully up to speed with respect to Social Media, but as a senior executive, have no desire to jump into the weeds? Are you looking at how Social Media can be used in your role as a leader, but are unsure how to appropriately connect your personal and organizational profile-building activities? 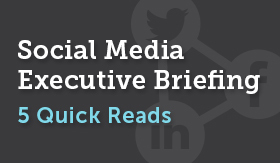 Each quick ‘read’ – delivered via email – will provide key action points to take advantage of social media trends and opportunities. Each read focuses on different aspects of social media and includes resources to take action.